The Eastern Brook trout (Salvelinus fontinalis), belongs to the char family. The Brookies have been planted through hatchery programs throughout the state and has become well-established in those areas above 4,000 ft. elevation, within small lakes and streams. The brookie does well in these waters since it does not require active stream water to spawn while most of the natural spawning by the Brook trout occurs within the spring areas of small lakes. Many of the small lakes within the Sierras also have restricted tributaries and this capability of the Brookie serves them well. In some lakes, such as Kirmen Lake, large brookies can be found. The California State Record is 9 lbs. 12 ozs. Most lakes, however, are poor in nutrients, therefore, many of the brookies do not reach large size. The Brooks spawn in the Fall around mid-October to November. When the Brook Trout were introduced to California waters, the native rainbows were also called "brook trout", locally. Therefore, most identified the new introduced species by injecting "Eastern" in front of it's name. The Brook Trout was first described by Samuel Mitchell in 1815 from fish caught near New York City. The term "fontinalis" means "living in springs". The first plants of Brook Trout in California was in 1872. A noted Sierran mountaineer, Norman Clyde, is reputed to have introduced this species to hundreds of Sierran Lakes. Most success took place in unhabitated waters. The Brook Trout have a very difficult time competing in areas with other trout, especially those areas which have strong tributaries to the sea. Many of the areas that Brooks have success are in possible "Golden Trout" habitat and DFG is looking at eliminating the Brooks in these areas in perference to the Goldens. 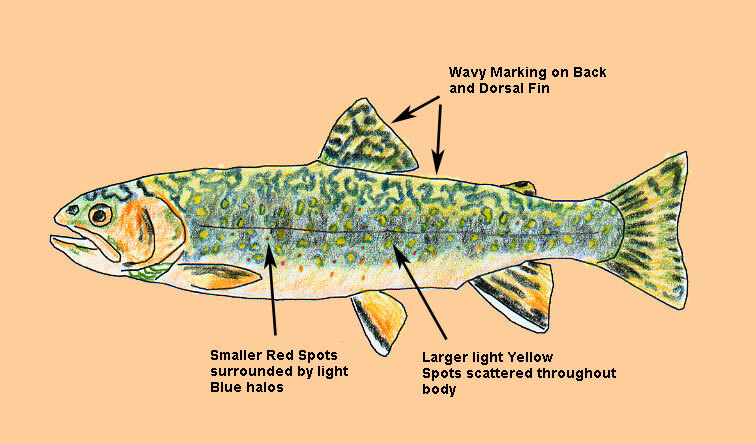 Brook Trout are generally dark olive green with light spots on the sides which turn to worm-like marbling on the back. The dorsal fin has dark wavy lines. No black spots are present on the body but red spots are usually present on the sides. Some of the red spots can have a bluish halo. The Belly is white except during spawning the belly turns orange-red, particularly on the males. Typical size is 5-7 inches.